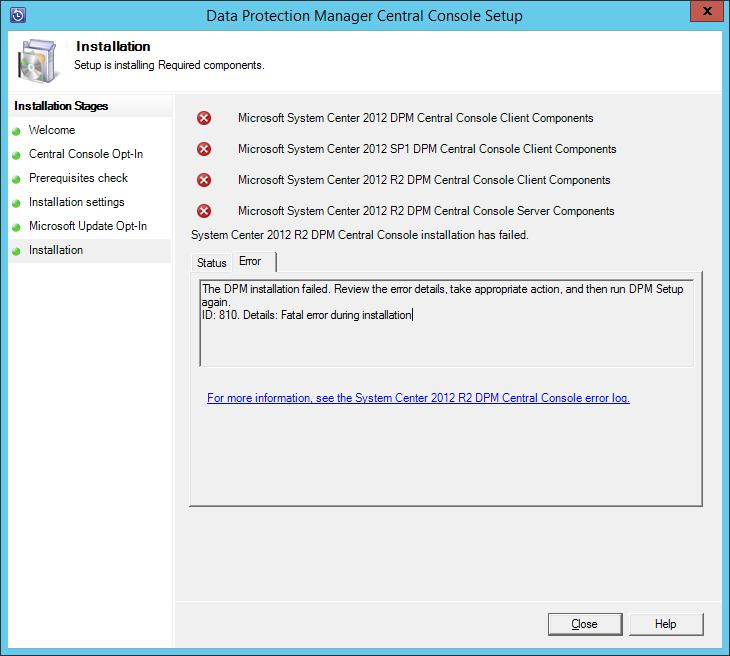 I encountered this error while attempting to install the System Center Data Protection Manager (DPM) Central Console on my Operations Manager (SCOM) Management Server. I was following this TechNet article: http://technet.microsoft.com/en-us/library/hh758189.aspx. The TechNet article lists 2 steps for this process, namely Install the Operations Manager agent, and Install Central Console. After you install the Operations Manager agent, set the following registry key – [HKEY_LOCAL_MACHINE\SOFTWARE\Microsoft\Microsoft Operations Manager\3.0\Modules\Global\PowerShell] “ScriptLimit”=dword:0000000f. After you modify this setting, restart the Health Service (System Center Management). However, after I installed the SCOM Agent, this registry entry was not present. In fact, the Registry Key only went as far as: HKEY_LOCAL_MACHINE\SOFTWARE\Microsoft\Microsoft Operations Manager\3.0\Modules. But, after walking through the installation of the Central Console on the Operations Manager (SCOM) Management Server (although the installation failed, more on that in a bit), only then did this Registry entry appear on the DPM server. That’s interesting. Especially when I specifically installed the Visual C++ 2008 Redistributable, since without it, you will encounter this error when first running the Central Console installer. However, if you navigate to the URL provided, you will end up at the download page for the Microsoft Visual C++ 2008 Redistributable Package (x64). Note the x64 part. But what is interesting is, if I install the x86 version of the Visual C++ 2008 Redistributable, this error no longer appears and I can continue with the installation. However, it’s not until the end of the attempted installation that the previously mentioned error occurs, and the log file states that the Microsoft Visual C++ 2008 Redistributable is not installed. So, I downloaded the x64 version of the C++ Redistributable, installed it, then attempted the DPM Central Console installation again. The result? 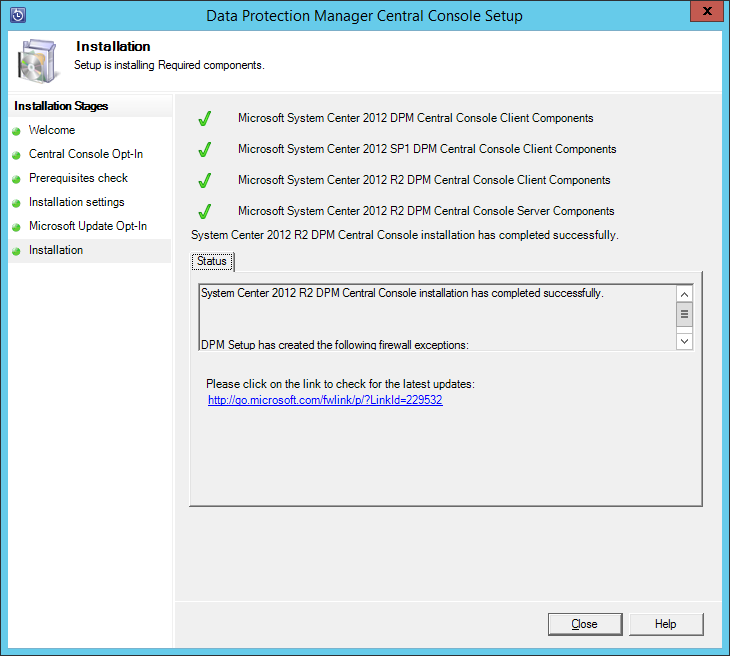 And if we launch the Operations Manager (SCOM) console, we will now see the monitoring for System Center 2012 R2 Data Protection Manager. Notice that we can get details on specific workloads (i.e. 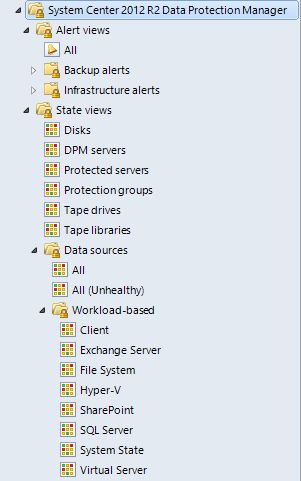 Exchange, Hyper-V, SharePoint, SQL Server), along with state data on the disks, protection groups, and tape drives/libraries.